Hospitals face the highest number of cleanliness challenges in Columbia SC. The healthcare facilities are meant to keep people safe and having anything that will undermine that can cause a lot of losses. These areas require special and attentive cleaning services to maintain a healthy environment for doctors, patients, and anyone around the hospitals. This is because the fields are visited by patients who carry different types of bacterial infections and germs. When you hire janitorial cleaners to clean your medical center, you improve the overall health of the facility environment. Professional cleaners understand how to disinfect the place and the places to focus most to prevent cross-contamination. They know the sensitive areas and the germy points where they put most of their effort to stop the germs before they spread. Also, most medical office cleaners provide green cleaning program. This means that they can do more than just cleaning the surfaces of the hospital; they can also improve the indoor air quality by using non-toxic, safe, environmentally friendly products. The professional cleaners are well-trained which means that they have the knowledge and skills needed for professionalism. Cleaning is their primary job, and they do it with a passion and positive mind. Letting your staff do the cleaning job makes things worse since they want to finish up as fast as they can so that they can go back to their regular duties. This leads to poor cleaning and the hospital acquired infections are left to keep spreading. With janitorial cleaners, their only aim in that hospital is to clean and maintain a healthy environment. You can rest assured that they will leave the place thoroughly clean and disinfected, leaving no chances for germs and bacteria. 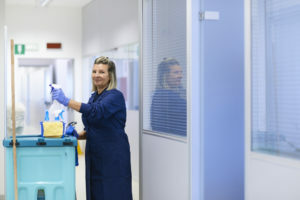 They may also offer training sessions to your staff educating them on how to observe cleanliness and how to meet the safety compliance of the infections. Also, a good cleaning company has been in the cleaning business for years; therefore, they have the required experience in handling cleaning chemicals. Professional cleaners work by paying attention even to the tiniest detail. They have high-quality equipment that helps them see germs which you cannot see with your naked eyes. Assuming that an area is safe just because it looks spotless can be misleading, and that is why you need to consider hiring experts to determine the safety of an area. Other than eliminating infections from hospitals in Columbia SC, outsourcing your cleaning services will do you a lot of good. It is beneficial and cost-effective. It saves time that would have instead been wasted by your staff in cleaning and this way they can concentrate on their jobs. Also, it attracts visitors, and patients will not be afraid of coming to your medical facility as they feel safe. A clean environment will also boost the worker’s moral so that they can be more productive. Once the hospital acquired infections have been eliminated, there are no risks of employees getting sick. This saves you the cost of workers’ compensation and ensures that productivity remains at the top. Do not leave any risks to chances. If you are in need of a cleaning company in Columbia SC, contact us today, and we will be there on time to help you keep your medical facility clean.